Garry Mead, assistant director of detention and removal for Immigration and Customs Enforcement, answers a reporter's question in 2007 in front of cells that housed immigrant families at the T. Don Hutto Residential Center in Taylor, Texas. After a suit by the ACLU, the center ended family detention, and ICE mostly avoided it until 2014. Katy Murdza is a volunteer with the CARA Family Detention Project, which provides legal advice to 2,000 mothers and children who are confined at the South Texas Family Residential Center. Kate Lincoln-Goldfinch is an immigration lawyer who works with clients inside the T. Don Hutto Residential Center in Taylor, Texas. Marta, a Guatemalan immigrant who was recently released from South Texas Family Residential Center in Dilley, Texas, with her 15-year-old son, waits for a bus at the Greyhound station in San Antonio, Texas. Inside a ramshackle ranch house in the inhospitable brush country of South Texas, a group of volunteers has been fighting family detention. The recent moves by the Trump administration to expand the confinement of undocumented families seeking asylum could make their 12-hour days even longer. "Tarantulas, we have rattlesnakes, we have scorpions," says Katy Murdza, advocacy coordinator for the CARA Family Detention Project, describing the wildlife on their grounds. "And we spend most of our time working." The volunteers come here from around the country to provide legal advice to 2,000 mothers and children who are confined in the gilded cage that is the South Texas Family Residential Center. "These are not criminals like the administration wants people to believe," she says. This sprawling complex of portable buildings is located on the outskirts of the town of Dilley, an hour south of San Antonio. 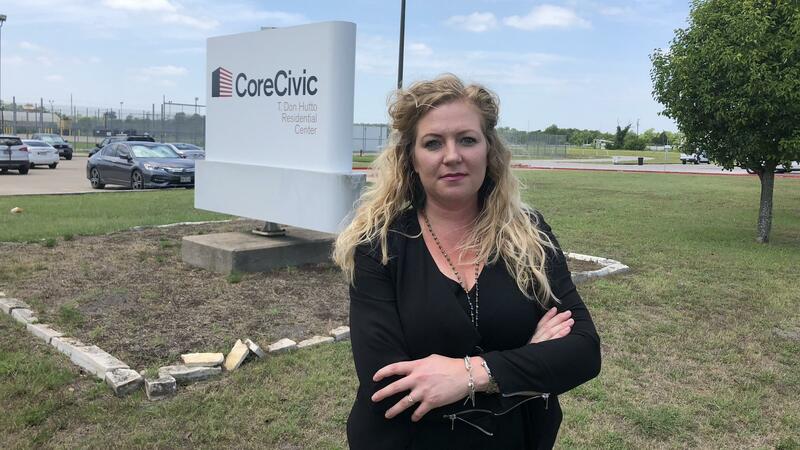 It's the largest of two family detention facilities in South Texas, and is overseen by U.S. Immigration and Customs Enforcement (ICE) and operated by for-profit corrections corporation CoreCivic. The problem for the White House is that the detention center is nearly at capacity. Trump's Homeland Security Department favors detention, saying detained immigrants cannot abscond and skip their immigration court hearings, and they are easier to deport if they don't receive asylum. The fly in the ointment, for Trump, is the Flores settlement. "The Flores settlement says that kids can't be detained any longer than is necessary, and right now it's limited at 20 days," Murdza says. This restriction was imposed by a federal judge in California. The Justice Department is currently working to overturn Flores, to ensure that families can be detained until their court date comes up. Meantime, immigrant parents and children must be released after three weeks. ICE straps an electronic ankle monitor on the mother, which allows immigration agents to track her location. Trump issued an executive order last week that canceled family separation after widespread public outrage. "What they're proposing in place of family separation," says Murdza, "is a return to the early days of family detention, where families were detained indefinitely." Late Friday, the Justice Department announced it would — as these attorneys feared — begin detaining asylum-seeking families indefinitely, beyond the 20-day limit in Flores. But it did not specify where they would housed. "It was just a prison." Three hours north on Interstate 35, just past Austin, is the city of Taylor, Texas. Here, between rolling hills and a train track sits the T. Don Hutto Residential Center, which opened 12 years ago as a medium-security, 500-bed jail to hold families seeking asylum. Conditions were appalling, according to Kate Lincoln-Goldfinch. She was a law school student volunteering there in 2007. Now she's an Austin immigration lawyer with clients inside the facility. "There's barbed wire, there are prison guards," she says of the 2007 conditions. "There's counts throughout the day so that people are in their cells for hours of the day, there's no free movement around the facility, the food was terrible. You know, it's just a prison." 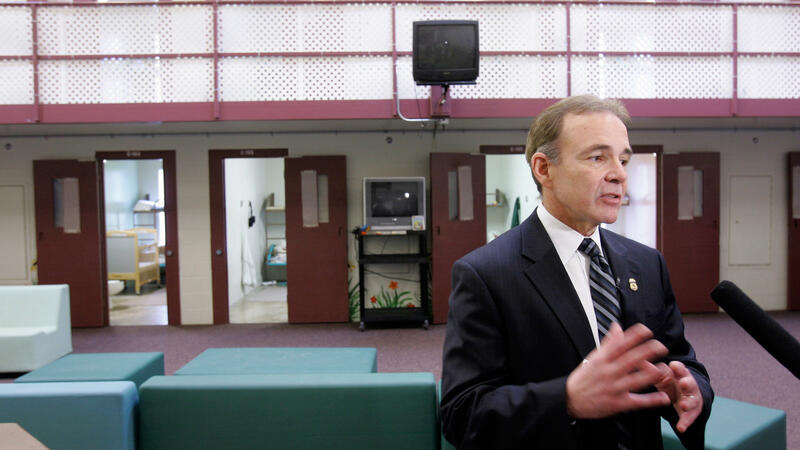 The ACLU sued over poor education, substandard health care, and a lack of privacy at T. Don Hutto, named for the co-founder of Corrections Corporation of America, now CoreCivic. The Obama administration settled, promising to improve conditions. ICE removed barbed wire, repainted the walls bright colors, let detainees wear their own clothes, offered classes to children, and even took them on field trips. However, in 2009, ICE abandoned family detention at T. Don Hutto altogether, and changed the detainee population to single females. In a compliance report on the facility that year, U.S. Magistrate Judge Andrew Austin observed, "While ICE can call Hutto 'a juvenile and family residential facility,' that doesn't change the fact that it is a jail. ... It seems fundamentally wrong to house children and their non-criminal parents this way. We can do better." John Sandweg, who was acting director of ICE from 2013 to 2014, said he took lessons from the T. Don Hutto case. "What I learned is that detention is a very difficult business, and no matter how well intentioned you are, when you confine people in facilities like that, under stress, bad things can happen," says Sandweg. ICE mostly stayed out of family detention until 2014— a few months after Sandweg left. Alarmed by a surge of Central Americans crossing the border illegally, ICE resumed confining asylum-seeking families. They first were held at a Border Patrol training camp in Artesia, N.M., and later at permanent facilities in Texas — the Karnes County Residential Center, in Karnes City, and the larger facility in Dilley. Learning from its mistakes with the T. Don Hutto facility, Lincoln-Goldfinch says ICE tried to make the new South Texas facilities more family friendly. "You go in the lunch room and there are murals of smiling broccoli. And then in the rec area, there's a playscape," she says. A 2017 report from the Inspector General of the Department of Homeland Security noted, after three surprise visits, that ICE's three family detention facilities were "clean, well-organized, and efficiently run." Further, the report concluded "ICE was satisfactorily addressing the inherent challenges of providing medical care and language services and ensuring the safety of families in detention." But advocates continue to complain that family detention centers deliver poor medical care and lack services for detainees who speak languages other than English and Spanish, and that conditions of confinement are not appropriate for young children, who exhibit problems like bed-wetting and weight loss. And advocates are fearful of what Trump's version of family confinement will look like. "The legal community is bracing for a fight again," says Lincoln-Goldfinch. "It's family detention 3-point-0." 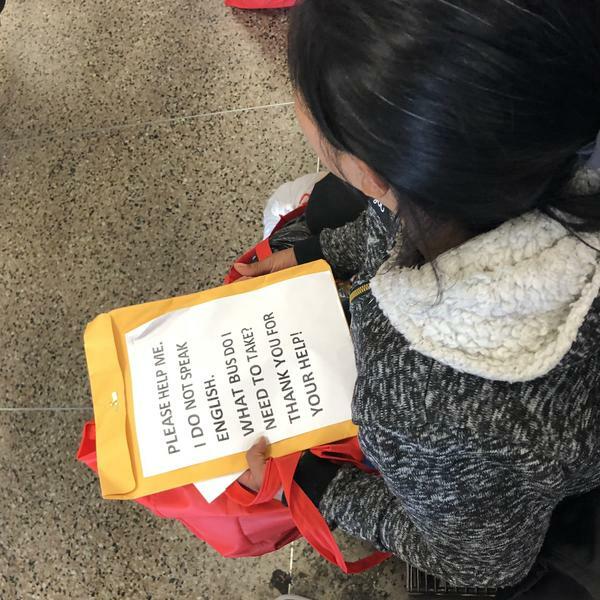 Families who are released from Dilley end up at the Greyhound station in downtown San Antonio. There, dozens of mothers with squirming children wait for buses to distant cities. They're recognizable by their colorful T-shirts, jeans and bulging ankle monitors — all courtesy of ICE. A woman from Guatemala who gives her name as Marta is asked what conditions are like at the Dilley detention center, which she had just left. "Mmmmmm, so-so," she says, noncommitally. Then her bright-eyed, 15-year-old son, Oliver, leans forward. "They don't give us freedom," he says in a clear voice. Now that President Trump has said he will no longer separate migrant families apprehended at the border, his administration is preparing to lock them up. The Defense Department is under orders to confine up to 12,000 immigrant parents and children on military bases. Two installations in Texas plan to start putting up temporary housing after July 4. As NPR's John Burnett reports, family confinement has had a troubled and litigious history in the U.S., and legal advocates for immigrants are preparing for a major battle ahead. JOHN BURNETT, BYLINE: Inside of a ramshackle ranch house in the inhospitable brush country of south Texas, a group of volunteers has been fighting family detention. Their 12-hour days could get even longer with recent moves by the Trump administration to expand the confinement of undocumented families seeking asylum. KATY MURDZA: Tarantulas - we have rattlesnakes. We have scorpions, and we spend most of our time working. BURNETT: Katy Murdza is a volunteer with the CARA Family Detention Project. She sits outside their office and home in a shady breezeway. They've come here to provide legal advice to 2,000 mothers and children who are confined in the gilded cage that is the South Texas Family Residential Center. MURDZA: These are not criminals like the administration wants people to believe. BURNETT: This sprawling complex of portable buildings is located in the town of Dilley an hour south of San Antonio. It's the largest of two family detention facilities in south Texas operated by private, for-profit corrections corporations. The problem for the White House is they're nearly at capacity. Trump's Homeland Security Department favors detention, saying detained immigrants cannot abscond and skip their immigration court hearings. And this makes them easier to deport when and if they don't receive asylum. The fly on the ointment for Trump is the Flores settlement. MURDZA: The Flores settlement says that kids can't be detained any longer than is necessary. And right now, it's limited at 20 days. BURNETT: This restriction was imposed by a federal judge in California two decades ago. The Justice Department is currently working to overturn Flores so that families can be detained longer until their court date comes up. Meantime, Flores says parents and children must be released after three weeks. Trump tried to separate families but canceled the practice after widespread public outrage. Katy Murdza says another ugly confrontation is brewing. MURDZA: What they're proposing in place of family separation is a return to the early days of family detention where families were detained indefinitely. BURNETT: We've been here before. Three hours north on Interstate 35 is the city of Taylor. Here, between rolling hills and a train track is the T. Don Hutto Residential Center. It opened 12 years ago as a medium-security, 500-bed facility to hold families seeking asylum. Conditions were appalling according to Kate Lincoln-Goldfinch. She was a law school student at the time volunteering there. Now she's an Austin immigration lawyer with clients inside the facility. She remembers what she encountered there in 2007. KATE LINCOLN-GOLDFINCH: There's barbed wire. There are prison guards. There's counts throughout the day so that people are in their cells for hours of the day. There's no free movement around the facility. The food is terrible, you know? It's just a prison. BURNETT: The ACLU sued and settled with the Obama administration. The civil rights group complained about poor education, substandard health care and no privacy. Two years later in 2009, Immigration and Customs Enforcement abandoned family detention and only housed single females of at T. Don Hutto. John Sandweg came on as ICE acting director a few years later. JOHN SANDWEG: What I learned was that detention is a very difficult business. And no matter how well-intentioned you are, when you confine people in facilities like that under stress, bad things can happen. BURNETT: Fast forward to 2014. Alarmed by a surge of families crossing the border illegally, ICE jumped back into family detention with the two big facilities in Texas - one in Karnes City, the other in Dilley. 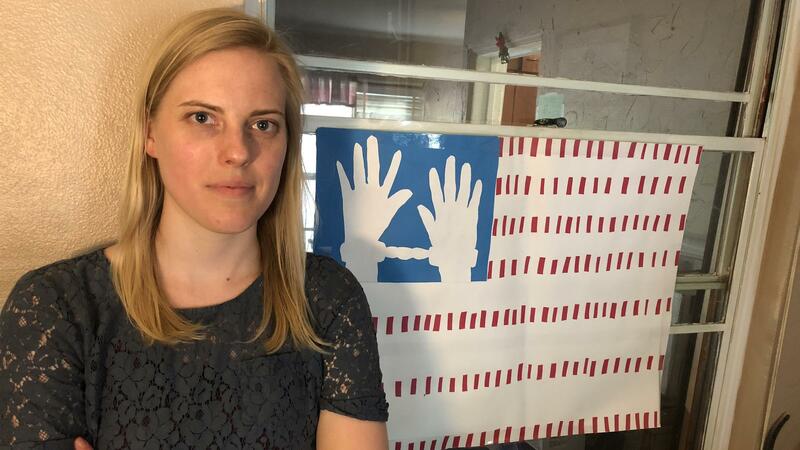 Rather than repeat the mistakes of T. Don Hutto, Kate Lincoln-Goldfinch says ICE tried to make them more family-friendly. LINCOLN-GOLDFINCH: You go in the lunchroom, and there's murals of smiling broccoli. And then in the rec area, there's a playscape. BURNETT: Lawyers say conditions at existing family facilities have improved. They're more humane, but they're still not appropriate for young children who exhibit problems like bed-wetting and weight loss. And advocates are fearful of what Trump's version of family confinement will look like. LINCOLN-GOLDFINCH: The legal community is bracing for a fight against family detention 3.0. BURNETT: Immigrant families that are released from Dilley because of limitations on detaining children end up here at the Greyhound station in downtown San Antonio. Dozens of mothers and squirming children wait for buses to distant cities. A woman from Guatemala who gives her name as Marta is asked what conditions are like at the Dilley detention center that she just left. BURNETT: "So-so" is all she says. Then her bright-eyed 15-year-old son Oliver leans forward. BURNETT: "They don't give us freedom," he says. John Burnett, NPR News, Austin. Transcript provided by NPR, Copyright NPR.